Meet Ove. He's a curmudgeon—the kind of man who points at people he dislikes as if they were burglars caught outside his bedroom window. He has staunch principles, strict routines, and a short fuse. People call him "the bitter neighbor from hell." But behind the cranky exterior there is a story and a sadness. So when one November morning a chatty young couple with two chatty young daughters move in next door and accidentally flatten Ove's mailbox, it is the lead-in to a comical and heartwarming tale of unkempt cats, unexpected friendship, and the ancient art of backing up a U-Haul. All of which will change one cranky old man and a local residents' association to their very foundations. This profound transformation will pull you in too, leaving you to consider how much you know—and how much you don't know—about those around you. It might even teach you to become a better listener. This grumpy man’s story is written with much heart and humor! This was my first time reading anything from Swedish author Fredrick Backman, and he won my heart with this grumpy man’s story! The beginning of A Man Called Ove made me very curious about Ove. Why is this old man so cranky? I learned right away that he’s an old fashioned kind of guy. Ove has a preference to a certain Swedish car brand and would very much like his neighbors to just follow the rules of the community. Is that so difficult? Apparently, some people can’t read signs. I also got a strong feeling that Ove is lonely. At this point I felt very sad for him, but I still wanted to know why. Then one day a new family moves into the neighborhood. Ove is extremely annoyed by this family, but he would soon find out that they were destined to meet. This story takes place in Sweden. 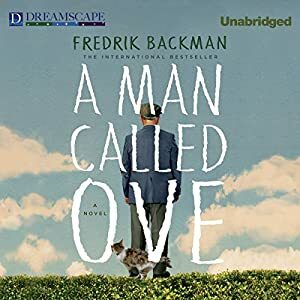 Fredrick Backman unfolds Ove’s backstory gradually and with much care through serious, emotional, and often funny flashbacks. I learned why Ove is the way he is now. His past is filled with meaningful moments, both loving and tragic. Yeah, I pretty much warmed up to the guy quickly as I learned more about his life. With a focus on friendship and how one man can make a significant impact in the lives of the people around him, A Man Called Ove is written with much heart and humor. This book definitely made me laugh and cry! It was my first time listening to George Newbern, and I quickly took to his narration. I liked his various voices for the characters, seamlessly changing between male and female voices. I particularly enjoyed his voices for Ove and Parvaneh. My Swedish friend recommended this book to me. I listened to the English version, but my friend listened to this audiobook in Swedish and said her experience was quite positive! Overall, A Man Called Ove is a truly heartfelt story. If you enjoy reads that follow the theme of fate stepping in at just the right moment, then I highly recommend this international bestseller! Upon reaching the end of this book, my friend so kindly sent me the link to A Man Called Ove movie trailer. Yes, this book has been turned into a Swedish movie, which has now been released in the USA. You bet my friend and I are so excited to see this movie! Do you like watching foreign language films?